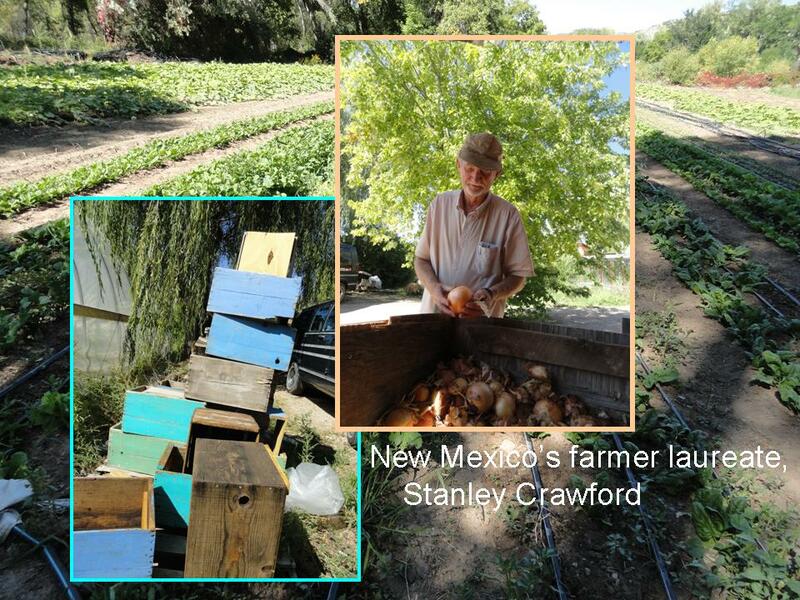 The fall equinox found the Foodshed Nomad in tiny Cañoncito, New Mexico. Who would guess that this minuscule outpost is glued together by a barter economy? Labor is traded for rent and jalapeño peppers are traded for a supply of winter meat from a sausage maker. There is striving to increase interdependence without losing independence. This seeming paradox is the lesson of Cañoncito. Cañoncito is a vintage landscape of classic Hispanic adobe homesteads strung like beads along the acequia channels. Old orchards are swallowed up by hedgerow brambles that outline pocket-sized fields of vegetables and flowers for market. Anglo newcomers, having rejected the information age, come to reconnect with the land and harvest solar energy. The hills are home to artists galore. The earthly pace of life makes the sun an adequate timepiece. Residents seem to cherish the lack of cell phone service. Here, relationships are nurtured with neighborly acts — gifting a sugar pumpkin from the garden, handing out some chile peppers to guests. More strategic offerings include discounted organic pea and winter rye seeds for cover crops that build soil and friendships both. In Cañoncito, I uncovered a secret agenda known as the “chess game” to expand organic agriculture parcel by parcel so that the wider landscape could provide organic honey for all. Lacking a mayor, volunteer community leaders collaborate to attract grant funds from outside this mountain economy and thereby cultivate a richer agrarian landscape. Cañoncito seems to have begun around 1860, at least that is when the oldest standing house was built, just a stone’s throw west of my yurt site. Nearby, the Spanish Embudo Land Grant was made in 1725 on land of the Tiwa people of Picuris Pueblo. The oldest house was occupied for 99 years by a woman who passed away just weeks before. Families of Martinez, Arellano, and others came to this valley and stayed, passing land, houses, and landraces of chile, squash, corn, and onions from parent to child. Landraces beat commercial varieties by having more genetic diversity from which new lines can be selected to be sweeter, shorter, more drought tolerant, more disease tolerant, more flavorful, more unique to this place, this climate, these people. Biting into a juicy local apple from Fred Martinez’s orchard reminds that its wetness is the water that flowed from the mountains, to the Rio Embudo, through the acequia, and up the roots of the 3,800 trees he prunes each winter. Thus, the bodies of each resident carry water from local food watered by the river, the rain and snow of this valley. 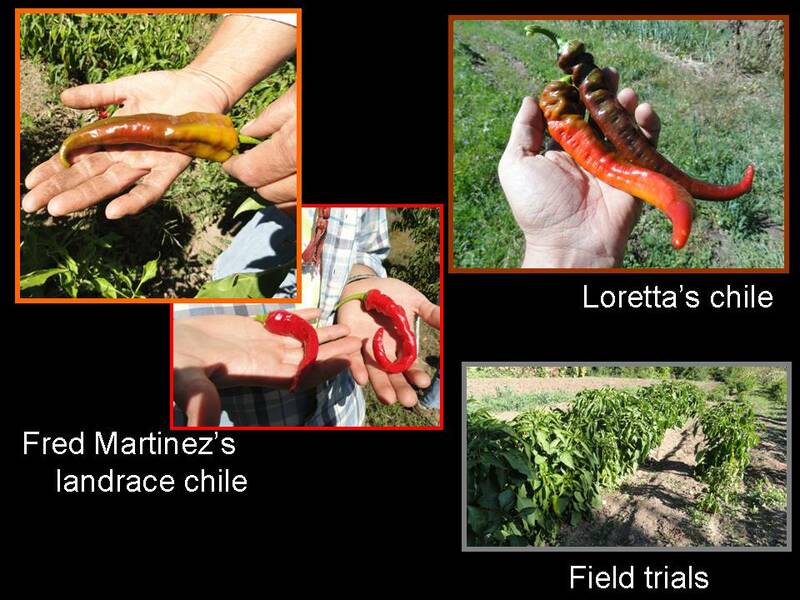 Although you can recognize a landrace chile by the hook at the end of the pod, you might not realize that the genes in each pepper trace back 150 years through generations of Cañoncito’s families. 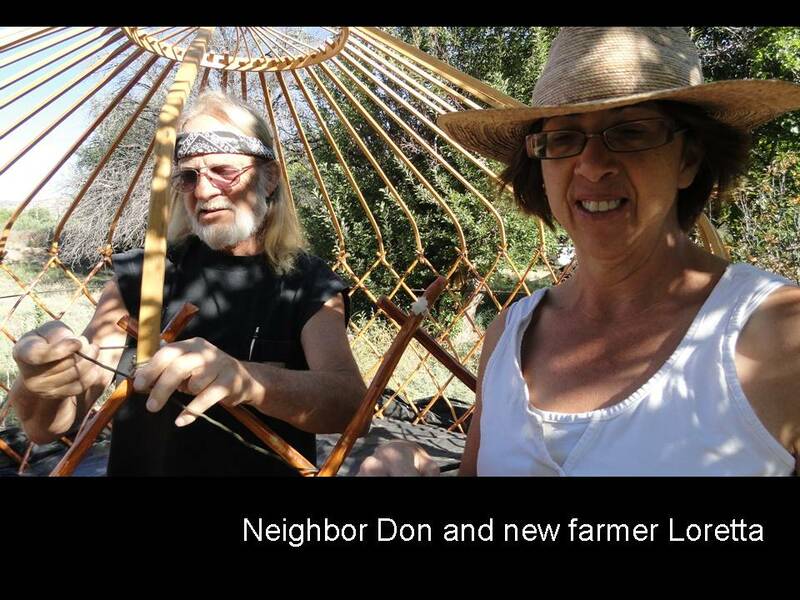 Wikipedia claims that adjacent Dixon, New Mexico is home to the largest number of organic farmers in the state. One of them was my gracious and indefatigable host, Loretta Sandoval, who has a background in chemistry, nutrition, horticulture and plant breeding. 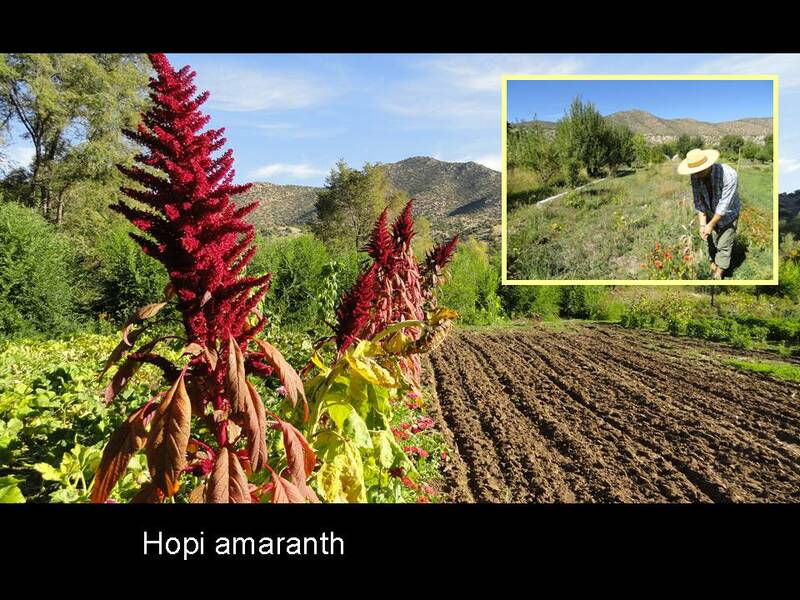 Her farm is a showcase of organic agricultural experimentation and innovation, both to isolate and preserve traditional varieties such as Hopi amaranth and to foster an appreciation for the agricultural heritage and well-being available to valley farmers she tutors. With her colleagues M.S. Campbell (farmer, landlord, and holder of a Ph.D. in chemistry), and J. Tucker of Embudo Vines, the team is researching cold-hearty varieties of grapes. Their field trials show that partnering the vines with beneficial soil fungi increases growth. Loretta took my student Mike and I on a tour of the acequias, a physical and social binder that promotes independent family food security through interdependence of community water management. We walked along the acequia ditch network which is the physical manifestation of the acequia association that manages irrigation water for its members. Acequias in both senses of the word are Arabic innovations introduced to Spain and later brought to the Americas in the late 1500s. 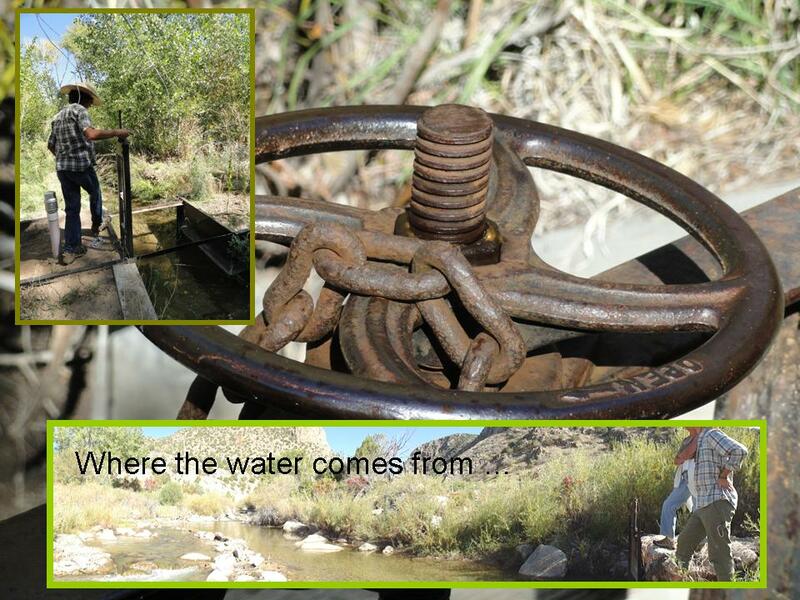 The acequia originates at the pressa, or diversion, that takes water out of the Rio Embudo and transports it along a dirt-bottomed ditch. At various points, further diversions are made to smaller channels that run along the contour of the slope, above the valley bottom. 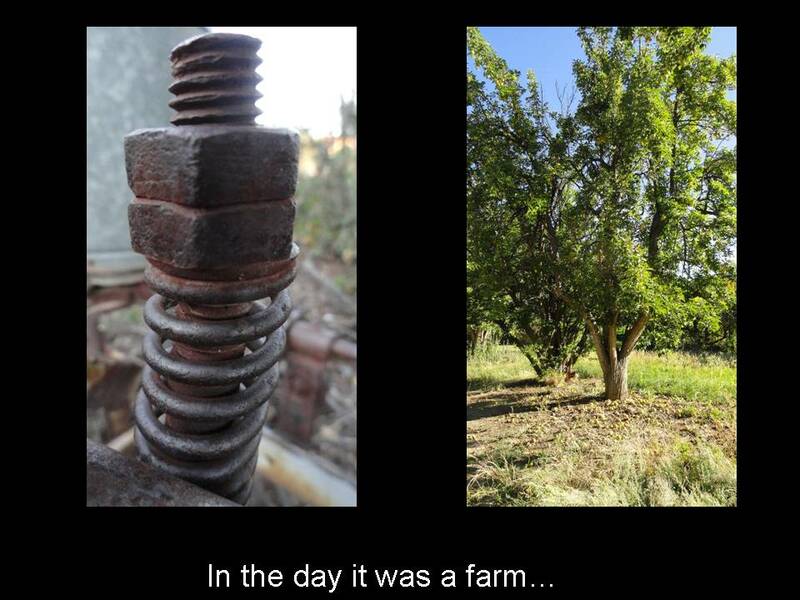 At each farm, yet finer diversions controlled by gates empty water onto the land according to a tight schedule that provides each farmer with water on selected dates for a set number of hours. None of this happens automatically. Rather, communication between the farmer, the commissioners, and the mayordomo is needed to coordinate the openings and closings of gates along the way. Sounds simple, until drought makes it more difficult for the downstream users to get their share. Once the water gets to Loretta’s two-acre farm, she uses a separate system of plastic pipes and valves to move the water around. 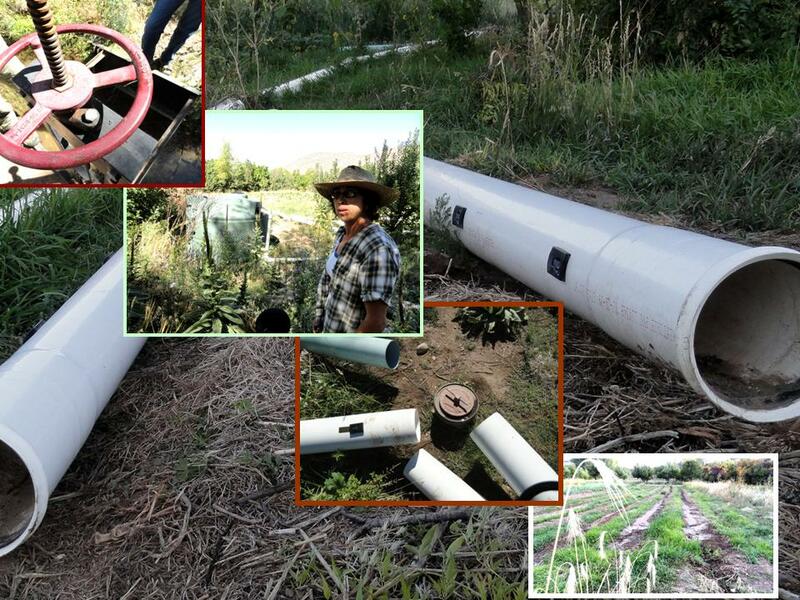 She doesn’t have pipes to cover all her needs, so all during irrigation day she connects pipe, irrigates a patch, disconnects, moves the pipe, reconnects, and waters elsewhere until needs are met. The last few sections of pipe run perpendicular to the tops of rows where the water pours out through little adjustable gates in the pipe, running downhill through the field until the end. All this requires skill and timing to account for differences in soil texture that affect how fast the water sinks in. Loretta has won several WSARE grants to pay back her investments in pipes, tanks, and valves. Here success inspires others. 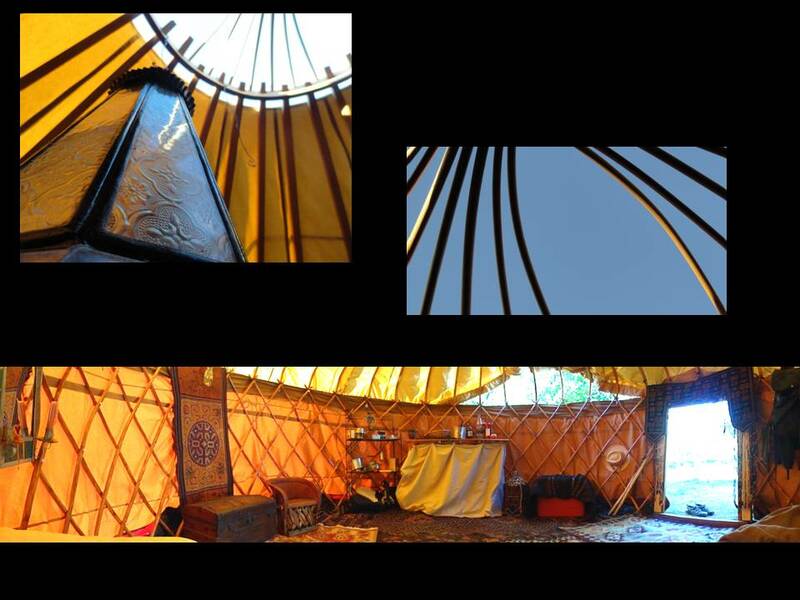 I reveled in the luxury of my 14-foot diameter yurt. Satisfaction increases with each day spent, like properly steeping tea. We pitched the yurt with the door facing due east so that the rising sun of the fall equinox would come in directly. Earlier in the summer it rose to the north of east. Later on the winter solstice it will rise further to the south. Throughout the day the yurt-as-sundial took on a subtly different glow and shadow pattern than during the August trip to Los Poblanos Inn, when the noon sun was higher in the sky. At night the clear sky and brilliant stars of the galaxy over Cañoncito testified to the astronomical lessons available to nomads, where the architecture of the yurt blurs the distinction between indoors and out and invites inquiry into the progression of days, seasons, and years. Visitors formed a steady stream all day Saturday, thanks to Loretta’s promotion via the local list-serve and word of mouth at the Taos market. Newcomer Marlene was visiting from Denver, exploring a place to live that fit the new chapter of her life. Little did she know that within 24 hours she would be renting a newly renovated cacita in Cañoncito, attached to the oldest house. Thus Mary would become Marlene’s landlady, with the prospect of trading labor for rent and joining the ranks of interdependent neighbors. 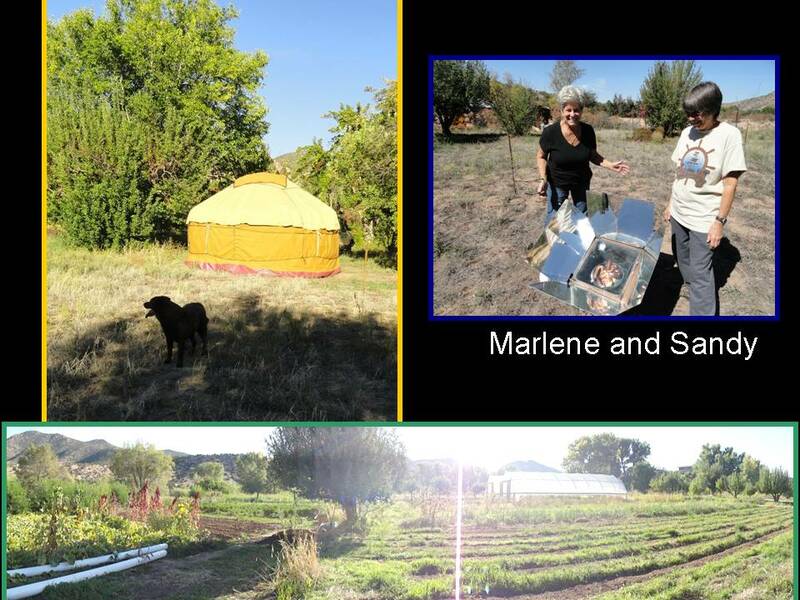 Along with Sandy, a long-term neighbor of the farm, Marlene and I put the solar oven to double duty roasting eggplants from the farm and cooking an easy casserole of lentils, quinoa, onions, peppers, eggplant, cinnamon, and cumin. With the oven at 275 degrees or so, the cooking went on for a few hours and provided us with a hearty meal before my lecture about the project in the Dixon Community Center. Here and in central Asia there is a curious asymmetry to the semi-nomadic experience. Each visit injects the nomad into a local community of people familiar with each other and their environment. The nomad is an outsider but welcomed visitor. In Asia, the nomadic tribe moves independently as a unit from place to place, bringing relations, colleagues, and partners along. But once situated, they become interdependent with sedentary locals who may trade effectively or not, be friendly or not. Thus, excursions in New Mexico reveal nuances generally ignored in the anthropological literature about Asiatic nomads. It matters where I setup. The effort of packing, moving, setting up, and repacking is weighed against the value of the experience to be had. Some places seem more suitable than others. Over time, nomadic people evolve travel routes that balance many needs with the effort involved, all of it contingent on the receptivity of local sedentary hosts and the availability of water and forage for their livestock. Thus, nomad ecology is one of independence and interdependence. The Foodshed Nomad is generally a tribe of one. On this trip however, one of my graduate students, Mike, a new transplant from Wisconsin, visited as my first overnight guest, forming a temporary tribe of two. We swapped his guitar to play our favorite songs and held an impromptu competition pitting my beloved old-school SVEA stove (see Tour the Yurt) against his high-tech stove to cook a delicious soup of noodles and re-hydrated mushrooms he imported from Madison. As an academically oriented tribe, we found the yurt a perfect escape for outlining a research proposal to seek support for Mike’s Masters thesis on optimized foodshed design based on state-space maximum entropy theory. The science was as nourishing as the soup. Once the yurt was packed up to go, I made a stop at the renowned farm of Stanley and Rose Mary Crawford. The photo shows his fabled wooden boxes, circa 1950, immortalized in an essay in his book River in Winter.